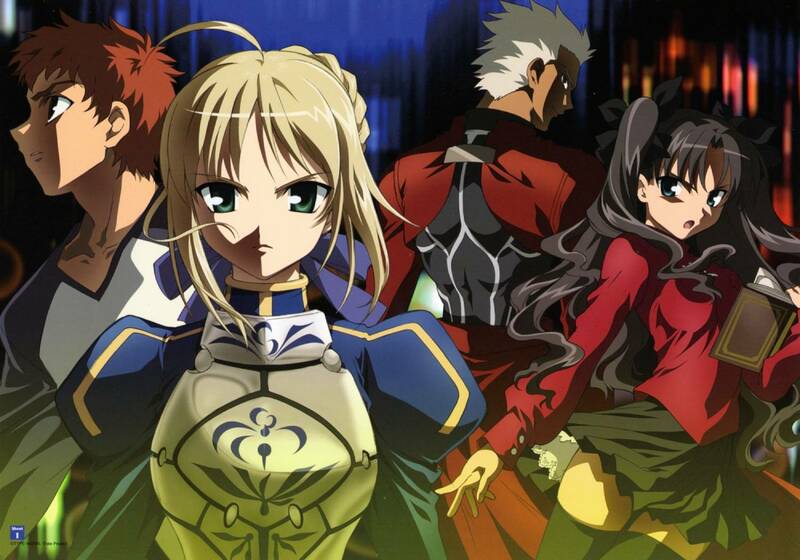 Animation studio ufotable's founder Hikaru Kondo announced on Friday that ufotable will produce a new Fate/stay night project. Kondo did not specify the format that the new project will take, nor did he specify if the project will be a remake. Studio DEEN previously animated the Fate/stay night television anime series (pictured at right) in 2006. The studio also produced the Fate/stay night: Unlimited Blade Works film in 2010, which covered The Unlimited Blade Works storyline from Type-Moon's game franchise. Sentai Filmworks released both the television anime series and the film in North America. Funimation had released the television series before that in 2009. Tokyopop published 11 volumes of Datto Nishiwaki's manga version in North America before its North American branch shut down in May 2011.
ufotable previously animated the Fate/Zero prequel television anime series that was based on Gen Urobuchi and Type-Moon's novel. Aniplex of America released that series in North America on Blu-ray Disc, and the company will release the series on DVD an Blu-ray Disc with an English dub later this year. Morikawa's long-running manga has spawned two television anime series, an OVA, and a TV special. 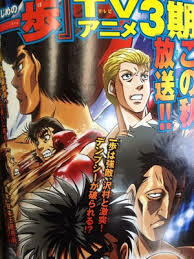 Hajime no Ippo: New Challenger, the second season of the anime, aired in 2009. Geneon Entertainment (USA) released the first television series on DVD in North America. Kodansha is publishing the manga in Japan, and will release the 104th compiled volume next month. Gintama 2nd movie: release on japan, trailer and ad. Gekijōban Gintama Kanketsu-hen: Yorozuya yo Eien Nare (Final Gintama the Movie: Be Forever Yorozuya), the second Gintama feature film, sold 221,469 tickets for 281,859,900 yen (about US$2.786 million) during its opening this past weekend. That is 40% more than the first Gintama: The Movie (Gintama: Shinyaku Benizakura-Hen) earned during its first weekend. With 127 screens, the new film had a per-screen average of 2,210,146 yen (US$21,800), the highest of all the films opening that weekend. 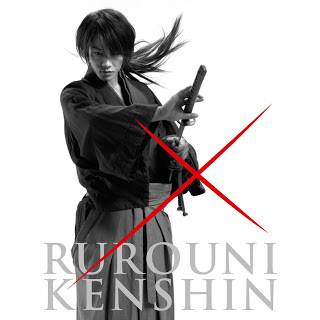 The August issue of Shueisha's Jump Square magazine is announcing on Thursday that two new live-action Rurouni Kenshin films have been green-lit for next summer. The films will cover the Kyoto arc of Nobuhiro Watsuki's original manga — specifically, the Great Kyoto Fire and Legend's End storylines. Takeru Satoh (Kamen Rider Den-O, Rookies, Beck) is reprising his starring role as Kenshin Himura. Keishi Ōtomo (Ryōmaden) directed the first live-action Rurouni Kenshin film, which opened in Japan last August. The film starred Satoh and Emi Takei (Kyō, Koi o Hajimemasu, For Love's Sake/Ai to Makoto). It had its North American premiere in Los Angeles in October, and it will play in San Francisco on July 28 and August 1. The first film will have its Japanese television premiere in NTV's Friday night movie timeslot. Watsuki's manga ran from 1994 to 1999 in Shueisha's Weekly Shonen Jump magazine, and the creator also drew the Rurouni Kenshin: Restoration retelling in Jump Square from May 2012 to this month. Hiro Mashima announce that a new Fairy Tail series comming soon, is suppose to be the continuation. As many have predicted, the next Gundam series will be Gunpla-related. It is officially announced today that the newest Gundam TV series titled Gundam Build Fighters will start airing on TV Tokyo and its affiliates in October this year. The series is directed by 34-year-old director Kenji Nagasaki who directed the No.6 TV anime series in 2011, and has drawn storyboards for many anime series including Mobile Suit Gundam AGE, Aikatsu!, Blast of Tempest, and Guilty Crown. The story of Gundam Build Fighters is set in the near future world when Gunpla Battle, a fighting competitions using Gundam plastic models have become popular worldwide. Sei Iori, the only son of a model shop owner meets a mysterious boy named Leiji. They will aim for victory at the world tournament of Gunpla Battle. To fans of previews gundams i dont recomend this, look very different to others gundam series. 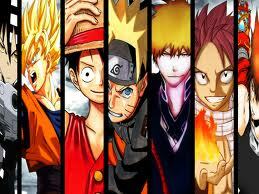 The Top 10 best selling manga for the first half of 2013. 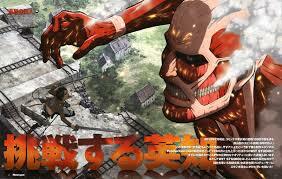 The list takes the manga sales for each series from December 12, 2012 until May 27, 2013. The number of copies sold is an estimate for the total number of sales from the time period. An announcement of three new titles to add to the pages of the weekly publication. Included in the list of newly-serialized manga is Akira Toriyama’s latest project: Ginga Patrol Jako. Ginga Patrol Jako‘s first pages will see the light of day on the 33rd issue of Weekly Shounen Jump, hitting the bookshelves on July 15, 2013. The June issue of Kadokawa Shoten's Newtype magazine is reporting on Friday that production on a second season of the Chūnibyō demo Koi ga Shitai! television anime has been green-lit. A teaser had aired in March to reveal that the anime has had its "contract renewed," but it did not specify that there would be a second season on television. The television anime's first season had premiered in Japan last October. Sentai Filmworks acquired the series for digital and home video distribution in North America, and The Anime Network is streaming the series. 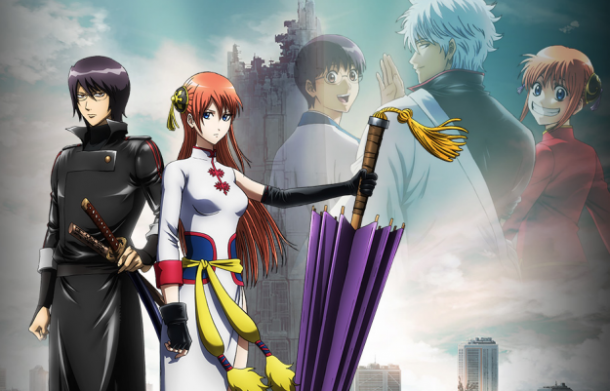 The trailer for the upcoming Gintama movie is out! Even though it’s just a short tease! The movie will be in Japanese theater this july 6, 2013. 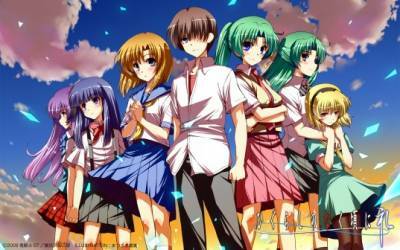 "Higurashi Outbreak" is set in the same Hinamizawa village of the previous stories. The village has been completely sealed off due to a mysterious virus in 1983, and Keiichi Maebara and Rena Ryūgū deal with the outbreak. 07th Expansion's original Higurashi no Naku Koro ni visual novel software revolved around murders that coincide with an annual festival in a quiet rural village. The software inspired two television anime series, several video anime projects, two live-action films, and manga adaptations by several artists. Click Here to see the trailer Warning there are some Gore action. 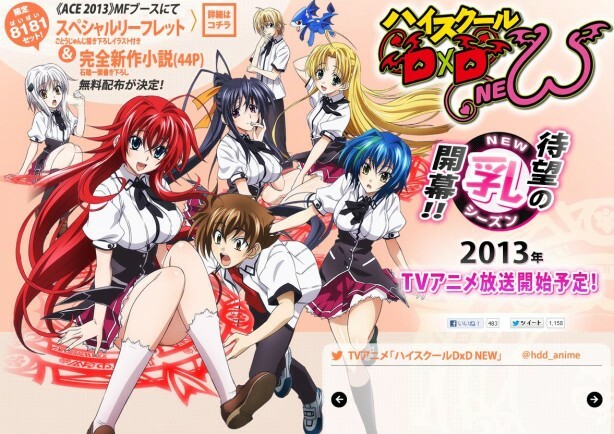 High School DxD’s second season is anxiously promoting a 2013 premiere, and while the exact date is not clear, the series has, however, promised the first PV will arrive at ACE at the end of the month. The official Twitter account for the To Love-Ru -Trouble- Darkness anime confirmed on Sunday that production on a new anime project has been green-lit. The announcement was first made at an event earlier in the day. More details will be revealed in the May issue of Shueisha's Jump Square magazine on April 4. Only the anime will be paused this month of march because it reach the manga. Start hoarding your pennies for plane fare, lab members, because April 20th is a good time to be in Japan - that’s the official release date for Steins;Gate Fuka Ryoiki no déjà-vu. The announcement came form the official Steins;Gate movie website (which posted the trailer back in November). They also posted links to the 30 participating theaters. The April issue of Hakusensha's LaLa magazine announced on Saturday that Matsuri Hino will end her Vampire Knight manga in the July issue on May 24. The series revolves around Yuki, a high school girl whose unique school features a "day class" of normal kids and a "night class" of vampires. She works with her adopted father and headmaster to prove that vampires can coexist with humans peacefully, but the school — and the vampires — hide many secrets. Hino launched the manga in LaLa in 2004, and the manga entered its final arc last month. Hakusensha published the 17th compiled book volume in December. Viz Media will publish the 16th volume in North America next month, and the company also released the 2008 Vampire Knight anime series and its Vampire Knight Guilty followup. Anime fans have selected their most anticipated upcoming anime of the 2013 winter season, quite possibly ready once again to have their hopes dashed hard. 14. Mondaiji-tachi ga Isekai kara Kuru Sou Desu yo? The new project will be entitled Higurashi no Naku Koro ni Kaku (ひぐらしのなく頃に 拡), and its plot based on Higurashi Outbreak (ひぐらしアウトブレーク), a short story from series author Ryukishi07 that was included in the original soundtrack for the Higurashi Daybreak doujin third-person shooter on the PC. According to Twitter user hiro@さすらいのイベリーマン, the surprise announcement came during the event’s ending roll, where they listed the names of all the special guests in attendence and thanked everyone. The credits roll eventually culminated in the announcement of the new anime project for 2013, which hiro here described as Higurashi no Naku Koro ni Kaku Outbreak (ひぐらしのなく頃に 拡アウトブレーク). Manga creator Rei Hiroe announced on Monday that he will "finally" resume his Black Lagoon manga in Shogakukan's Sunday GX magazine in January or February. The manga has been on hiatus since the middle of 2010. Viz Media publishes the manga in North America. The manga inspired two television anime seasons and a video anime project. The February 2013 issue of Kadokawa Shoten's Monthly Shōnen Ace magazine announced on Wednesday that Jinsei Kataoka and Kazuma Kondou's Deadman Wonderland survival action manga will be returning from hiatus on January 26 in the magazine's March issue. The announcement also revealed that the newest chapter will begin the manga's final arc. Kondou also announced the news on his Twitter account on Wednesday and posted a preview image. The image (pictured at right) says, "the final carnival begins." The series took a break in April after Kataoka announced her pregnancy. Kataoka revealed on her blog in November that she gave birth to a healthy baby boy in July and would return to the series soon. Kataoka and Kondou premiered the series in Monthly Shōnen Ace in 2006. Tokyopop published the first five volumes of the manga before the company shut down its North American publishing division last year. Kadokawa Shoten released the manga's 11th compiled volume in Japan in October 2011. The manga received a 12-episode television anime adaptation last year, and Funimation released the series in North America on DVD in October. Click Here to See more Anime News.